Official Members of SLSS-UK for 2557-2560 B.C. 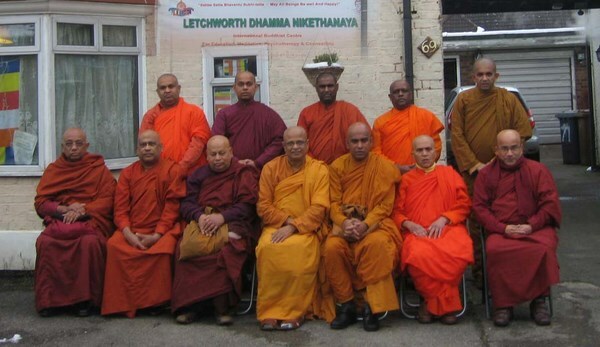 / 2013-2016 A.D.
General Meeting of Sri Lankan Sangha Sabha in the United Kingdom (SLSS-UK) was held on Friday 25th January 2013 at Letchworth Dhamma Nikethanaya Buddhist Cultural Centre. This was the seventh consecutive meeting and the second general meeting held after its revival since 2009. The General Meeting was well attended with over seventeen respective members of the venerable monks representing Sri Lankan Buddhist Temples in the United Kingdom in a blissful spirit of solidarity. 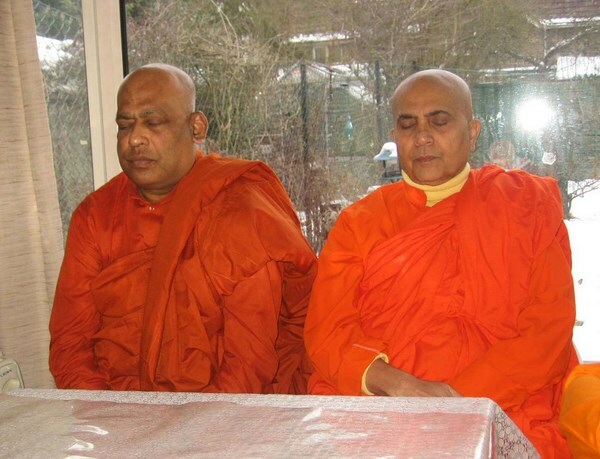 Sri Lankan Sangha Sabha of The United Kingdom (SLSS-UK) was initially found in 1991 under the honourable patronage of Most Venerable Dr Medagama Vajiragnana late Sangha Nayaka Thero, former head monk of London Buddhist Vihara and Chief Prelate of Great Britain. However, this monks’ council became dormant being inactive since 1998 for 11 years due to unstable health of the venerable head monk of London Buddhist Vihara. 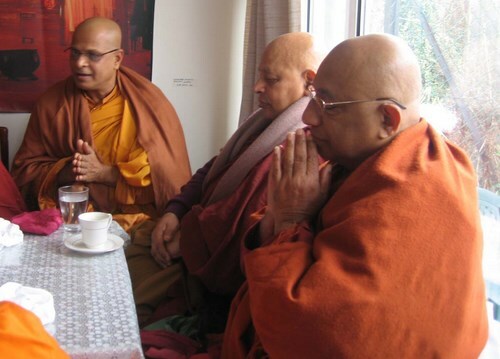 Fortunately this council was reawakened by hosting the first meeting on Wednesday 27th May 2009 at London Buddhist Vihara, with the strenuous efforts of Most Venerable Bogoda Seelawimala Nayakay Thero, the head of London Buddhist Vihara and the chief prelate of Great Britain and with the fully engaged earnest and profound interests of all the Sri Lankan monks representing all the Sri Lankan Temples in the United Kingdom, particularly to fulfil an extremely timely need for a united congress. Chairing the second general meeting Venerable Bogoda Seelawimala Nayaka Thero appreciated in high esteem the dedication and enthusiasm of Sri Lankan Monks living in the United Kingdom and also the support given to uphold its objectives which led to achieve tremendous amount of good will within a very short period of time and also to make historical contributions to the world, particularly to Sri Lanka, to Europe and to the United Kingdom. Among them being a very useful and strong organization during the very difficult time in reconciliation, recreation and rehabilitation of Sri Lankan political, religious, humanitarian, international and economic environment, just after 30 years of terrible war terrorism and also launching a unanimous (with all Buddhist denominations, interfaith groups and British High Officials) extremely successful and historical Buddha Day Celebration to mark the 2600th Sambuddha Jayanthi, Our Lord Buddha’s Enlightenment Anniversary in London on Sunday 29th May 2011 are two to be highlighted as paramount. London Buddhist Vihara, The Avenue, Bedford Park, Chiswick London W4 1UD. United Kingdom. Sri Lankan Sangha Sabha of United Kingdom encourages everyone in general public to engage constructively to share the noble benefits of this congregation. Next meeting will take place on Saturday 29th June 2013 at East London Lumbini Vihara. All the venerable monks and other attendees greatly appreciated the wonderful host of this general meeting 2013 A.D / 2556 B.C. by Venerable Akurala Samitha and members of Dhamma Nikethanaya Buddhist Cultural Centre in Letchworth. The Council also takes this opportunity to wish all a very blissful Vesak Buddha Day Celebration 2557/2013! May The Triple Gem Bless All! Long May Securely Last In The Universe, Teachings & The Order of The Blessed Gauthama Lord Buddha!